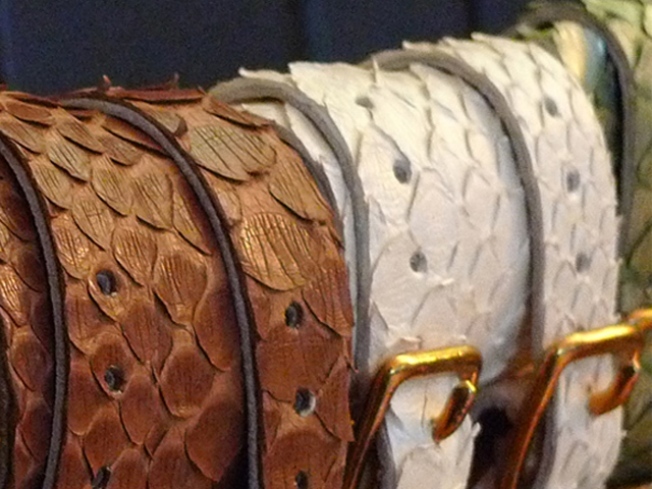 SHOW SOME SKIN: They’re a little bit jungly and a little bit rock-and-roll: Under the Yosef H label, Jared Handler handcrafts one-of-a-kind cuffs from exotic skins (like snake and alligator), making all other jewelry seem wimpy in comparison. Meet Handler and see the goods at a two-day Henri Bendel trunk show, August 6-8. Henri Bendel, 712 Fifth Avenue at 56th Street; 212-247-1100. HOME IMPROVEMENT: Aero’s just kicked off the summer-retreat sale, where you’ll get 50 percent off Thomas O’Brien for Hickory Chair pieces and 25% off Aero’s special-order home accessories and lighting. Shop through September 5; 419 Broome Street near Crosby Street; 212-966-1500.